This cornbread is fluffy and moist, with crispy edges and a warm, savory taste. It takes about five minutes to prepare and the rest of the magic happens in the oven. I made it for a vegetarian stuffing and figured I just had to share the recipe. It’s the perfect gluten-free and vegan accompaniment to a holiday feast, warm soup, a hearty salad, chili—or a flavorful alternative to bread for your holiday stuffing. This easy vegan and gluten-free skillet cornbread was inspired by this New York Times recipe. I used chickpea brine instead of eggs, but you could use either or. In addition, I used unsweetened, “natural” Coyo coconut yogurt but any unsweetened yogurt will do (Kite Hill also has a great Greek-style almond yogurt). I also used unsweetened almond milk in lieu of regular milk—or any plain, unsweetened plant-milk would work. Preheat the oven to 400 F and place the cast iron pan inside. 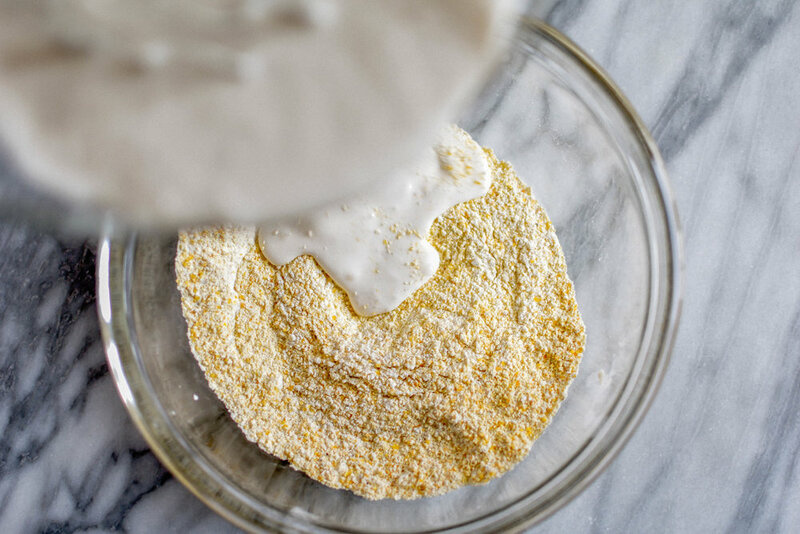 Combine the cornmeal, gluten-free flour, baking powder, baking soda and sea salt in a large mixing bowl. In a separate bowl, whisk together the chickpea brine, yogurt, almond milk and honey. Combine the wet and dry ingredients, being careful not to over-work the batter together. Once the oven is preheated, remove the cast iron pan and add the butter to the hot pan, swirling it around up the sides, until it melts. Once the butter has melted, stir it into the batter. Transfer the batter into the cast iron pan and cook for about 20-25 minutes or until the top of the cornbread is golden and the edges are crispy. Test for doneness by sticking a toothpick through the center of the cornbread. If it comes out clean, it's ready. Allow the cornbread to cool in the pan for about 5-10 minutes before slicing and serving.